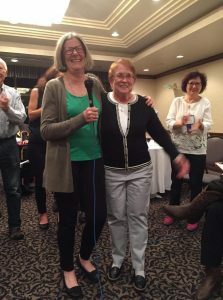 The above photo is of Joanne Kennedy and Eileen Strider at the IHLRN meeting in Victoria, British Columbia earlier this month. Joanne is the current president of IHLRN and Eileen just became a member of their Board. We are delighted that Eileen has agreed to be on the IHLRN Board as she has also just been elected to the Satir Global Board. This will give us the opportunity to build on what we are already doing together, for example, offering continuing education credits at the IHLRN meetings and supporting the development of the Satir archives. The two organizations truly complement each other as IHLRN offers an annual beautiful, healing community experience while Satir Global offers ongoing networking of persons around the world through video-conferencing, the weekly Satir Global News Flash, online courses and Satir related products in their online shop. Working together to further Virginia’s teachings seems to get more important and relevant with each passing week of violence and hatred being acted out by those who fear and vilify the differences of others.